I have one question of the Moffats. That is: "Where have you been all my life?!" I'm certain I've never read them before (although my husband did when he was growing up and he loved them). Maybe it's my attempt to be younger but while I have a hefty reading list for myself to finish the year off, I'm complimenting the 649 pages of Wives & Daughters with Young Adult books. Moffats included. I don't have much to say beyond "cute! cute! cute!" It's the story of four siblings (two boys, two girls) growing up in (what I think are) the 30's with their single mother, their father having died with the youngest child was just a baby. The children, whose mother seems to have a bad habit of shooing them out the door to fend for themselves, frequently fall into silly scrapes and have various adventures while they are out exploring. - The mother DOES "shoo" them out the door quite frequently. I understand she's a single mom trying to make a living. Whenever she is with the kids, she's very calm and loving and altogether likable. It's just curious to me that she's always sending them off without supervision of any sort. - The book is period dated. Children nowadays would not be enrolled in dancing schools as they were back then. I remember reading Gene Kelley and Debbie Reynold's biographies years ago and being taken aback that children would be sent do a dance school once or twice a week to learn how to waltz, fox trot, etc. You just don't her of that in this modern age. Most people I know who got into dancing (including myself) were part of a college group. 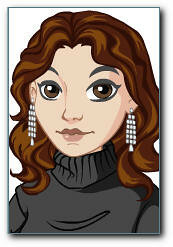 (My husband and I got to know each other through ballroom dancing, if you can believe it.) The idea of kids going to a dancing school wouldn't make sense to a modern aged child unless you explained how things were back in the 30's and 40's. Otherwise, a completely clean and charming book and I heartily recommend it! Best for ages 4-10, I'd imagine. I can totally visualize myself leaping into this series the moment my son shows the slightest bit of interest. Loved it! Now on to W&D . . . I totally agree with you. I loved this series as a child in the 70s and I read Rufus M. to my oldest and he loved it as well. I'd like to re-read the series someday. I love these episodic family stories written in the '30-'50s. Plus all of Eleanor Estes books are just plain wonderful! What a great blog, I love all of your ideas on the books that you feature. I wish I was a better reader, I LOVE it, but I often put it off with my schedule. I loved the Moffits too! And their little yellow house. It is dated...but that's okay I think. It gives children a look inside what life was like back then. 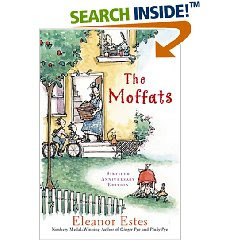 I've always loved the Moffats--even as a child I thought she had an amazing ability to remember what the world looked like to children. You might also look for books about the Pyes, who live in the same neighborhood. BTW, I think the books are actually set in the teens, since in one of the later books they celebrate the end of WWI. The sending off to play unsupervised--I think it just reflects the norm for that time and place. *All* the adults in town would be looking out for the kids. And honestly I grew up in the country playing for hours with very little supervision. I think it's better than Mom always interacting and directing, especially once kids get past about 5. Harder to do in the city, though. I just noticed your 3year Bible Book club. What is that, exactly? It looks awesome. Amanda discovered Estes books in the last few years. I read one recently, but I don't remember which one. I also remember thinking that the mom shooed them off. However, you have to remember, that was very common! I mean, even when I was 10 (28 years ago), I would go off around the neighborhood, and it was no big deal. I was recovering from a broken leg and was tired of watching TV all day. I discovered a copy of it in my book collection. I began reading it, and I was hooked! It is dated, set in the era of WWl, but the situations are believable. I especially ejoyed the Halloween adventure, and the dancing school part. However, I womder if Miss Nippon was Japanese. It does not say.